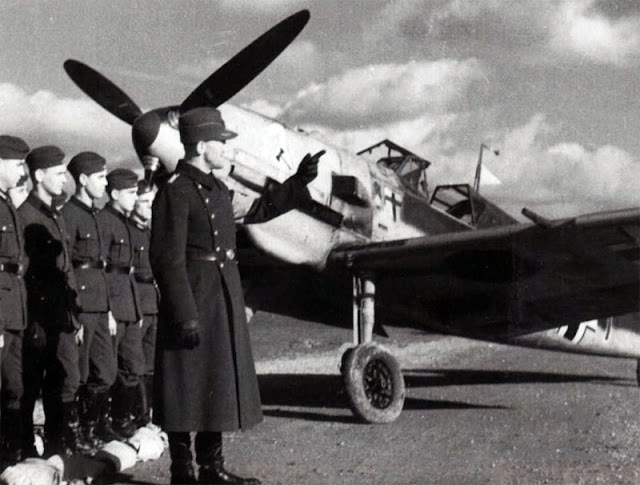 WNr 1559 can be a bit of a confusing one - it was the same machine that Balthasar had through the French campaign while with JG 1 and JG 27 (very briefly and hence the JG 1/JG 27 emblem under the cockpit) before he went off to a Staff job during the first half of the Battle of Britain. He then joined III./JG 3 with the same machine. 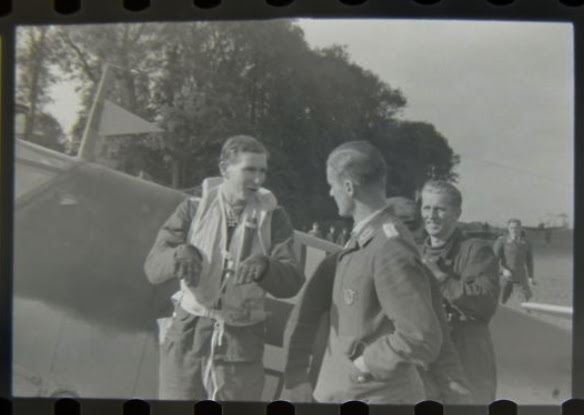 The blog post below has some nice views of Balthasar's JG 1 Emil - some time during July 1940 1./ JG 1 was re-named 7./ JG 27 and thus Balthasar was briefly Staffelkapitän of 7./JG 27 (ex 1./JG 1) although you will be hard-pressed to find this in any bios on the net. Barely a month or so after this re-naming, Balthasar departed for JFS Werneuchen, taking WNr. 1559 with him. Note the profusion of views of the port side of the tailfin, indicating that the victory Balken were unlikely to have been painted on the starboard side. The next link depicts Balthasar's Emil during the period he was Kommandeur of III./ JG 3 during the late Battle of Britain period.. Note that the green overspray has now been applied but there is no 'green 1' Kennziffer in front of the Balkenkreuz; unless Balthasar is standing in front of it ! Most likely WNr. 1559 is still 'White 1' at this stage. 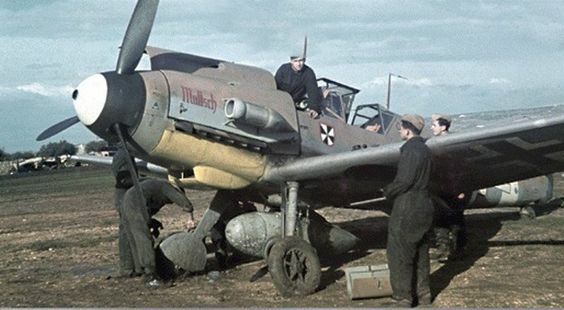 However in the image below note the new Gruppenemblem of III./ JG 3 - introduced by Balthasar -superimposed over the top of the 'White 1' still marked on the engine cowl, while in front of the cockpit the 'old' emblem of I./JG 1 (III./ JG 27) can still be seen. Note the spinner cap, probably red. 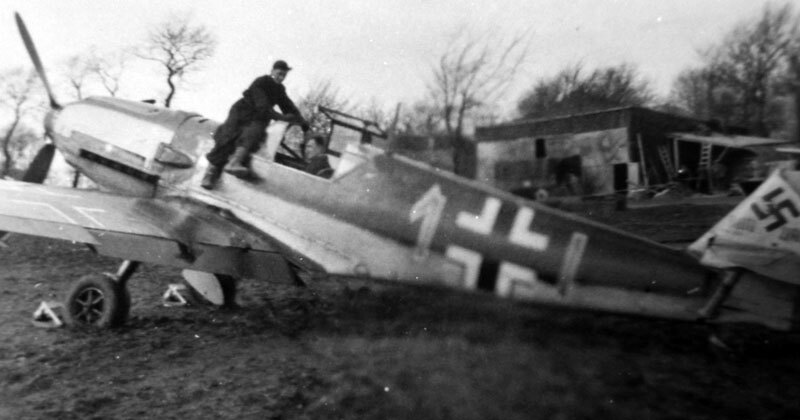 Compare this image with the photo on page 78 of Jochen Prien's III./ JG 3 unit history. In early 1941 Balthasar was appointed Kommodore of JG 2, so he was not with III./JG 3 for very long. His successor subsequently took over WNr. 1559 and then had it re-sprayed again. Hence pictures of Balthasar and Oesau with effectively the same aircraft. 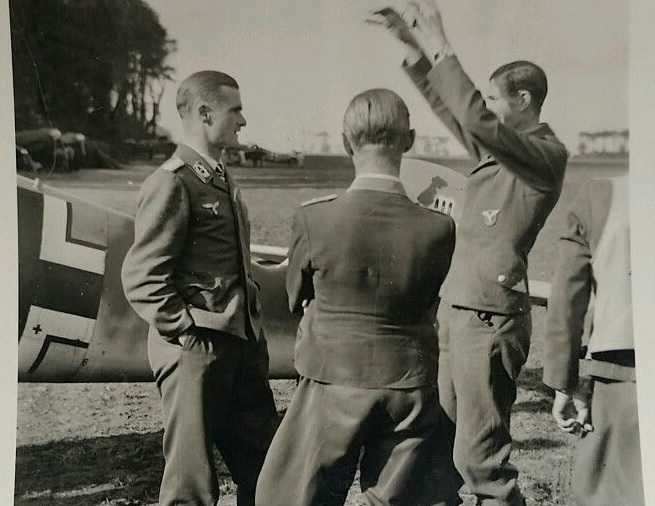 On page 83 of Jochen Prien's III./ JG 3 unit history there are two photos which clearly reveal the evolving finish applied to WNr. 1559 - in the image below, taken just after Balthasar left III. Gruppe in early 1941 to become Kommodore JG 2, the 'white 1' and axe emblem on the cowl have been over-painted. The pennant of the Kapitän on the antenna mast has been removed. In other words the pictures below of 'Green 1' are not of Balthasar's machine...note straight and lower demarcation on the fuselage and the III. Gruppe bar clearly visible.. Note how the fuselage finish differs from what can be see in the first image here (top). There seems to have a been a rough and ready overspray with a high demarcation with nothing around or over the main fuselage cross compared with the finish below which dates from early 1941. Conclusion; WNr. 1559 underwent a number of resprays. The image below dates from early 1941 by which time Walter Oesau had assumed command of III./JG 3..